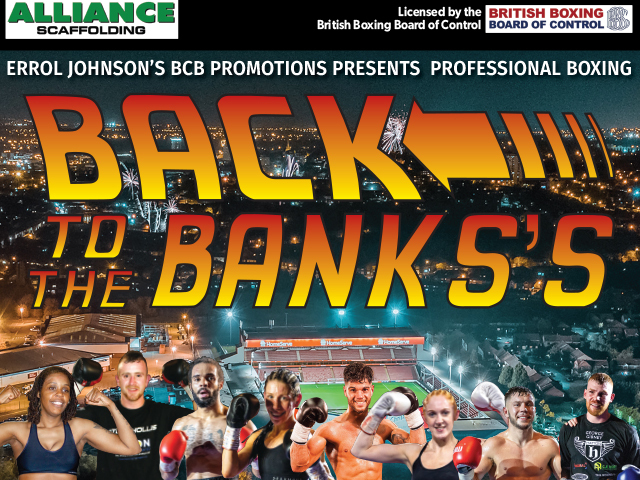 Professional boxing returns to the Banks’s Stadium, home of Walsall FC, next month. BCB promotions host an eight-fight card in the Stadium Suite on Friday, 24th May 2019, sponsored by Alliance Scaffolding. Girl power is prevalent on the card as females Rachel Ball, Lauren Johnson and Dani Hodges all feature. Wolverhampton’s Johnson appears for a fourth time, as a pro, after recording three points successes. The last was an eight-rounder to claim a British Challenge welterweight strap back in June. Now training with Richie Ghent, The Black Widow is looking forward to making waves at super welterweight. Aldridge’s Rachel Ball is back in action after her paper thin defeat in Norway earlier this year. The former world champion kick-boxer took on former WBC International and EBU European champion, Katherina Thanderz, in February. Losing by majority decision, Ball is hoping to bounce back at the Banks’s Stadium next month. Burntwood’s Hodges, another former kickboxer, has downed four opponents on points since becoming a British Boxing Board of Control licence holder last year. ‘The Pocket Rocket,’ aged 32, is one of the few lady flyweights in the UK and is coming off arguably her best win to date – an away day victory against previously unbeaten prospect, Lauren Parker, in Bedford last month. Dudley’s Ryan Aston makes a welcome ring return a year after his last outing. The Tank hasn’t fought since his April 2018 loss to Anthony Fox but now, training out of Coops Camp alongside Bavington, is hoping to make waves in the middleweight division. Walsall’s Levi Ferguson has made steady progress since turning professional last year. The 23 year-old is now 4-0 and improving with every outing. Ferguson was slated to appear at Walsall Town Hall earlier in May but has opted for an appearance at the Banks’s Stadium instead. Swadlincote middleweight, Ross Hollis, will be looking to make it four wins as he moves into his second year as a professional puglist. Ricky Hatton duo – Conah Walker and Chris Blaney – complete the card. Wolverhampton’s Walker is also a 4-0 23 year-old welterweight having turned over two months before Ferguson. Blaney, an Irish super middleweight, is 11-1. Tickets are £35 standard unreserved seating (£40 on the door) or £65 VIP Ringside (tables of ten) to include a buffet. Contact the boxers or call 01922 651 414 to book.